The research team report in the journal Science that this could drive the species to extinction in the north-eastern US in as little as 16 years. They examined 17 years' worth of data gathered from bat colonies. This Geomyces destructans fungus appears to thrive in the dark, damp conditions in these caves, where it grows on the bats' noses, wings and ears. "We went in to some caves and couldn't step on the floor because it was littered with dead bats," Thomas Kunz from Boston University told BBC News. "Before white-nose, the population was stable, in fact populations were increasing slightly," said Dr Kunz, "But when we plotted out the new data... it was pretty clear there was a massive die-off. "Strictly from this data, we predict that, in 20 years, this regional population is likely to go extinct, but that's making an assumption that there will be no recovery period." Dr Kunz likened the severity of the disease to the the chytrid fungus that has decimated some amphibian populations, and Devil Facial Tumour Disease, an infectious cancer that is threatening Tasmanian devils. "This is only the tip of the iceberg in terms of what we're likely to see in the next several years," he told BBC News. "And we've only looked here at one [out of the] six bat species that have been affected by the disease." 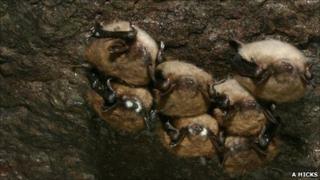 Other affected species include the northern long-eared bat and the tri-coloured bat. Currently, the fungus has only been detected in Europe and North America, and it does not appear to cause similar mass die-offs in European bat populations. But in the US, the prospects for the little brown bat are "pretty dire". The team is currently trying to identify colonies with a genetic resistance to the disease, to find out it they can use these animals to help rebuild the population. But that work is in its early stages. The scientists are also encouraging people to install bat boxes in their homes, and have even designed a "roost module" that can be inserted into the attic of a house. "People ask, 'why should we care? '," said Dr Kunz. "But we have to think about how important bats are to ecosystems. "A single bat can eat half its entire bodyweight in insects in one night, and many of those insects are agricultural pests. "So those one million bats that have died could have consumed about 694 tonnes of insects in one year." In the same issue of Science, a team led by Daniel Streicker from the University of Georgia revealed that bats may also have been unfairly tarnished with a reputation for infecting humans with rabies. Although an infected bat could infect a person or other mammal with rabies by biting them, the virus would be very unlikely to spread in the human population. Humans and bats are simply too distantly related, the scientists found. The likelihood of infection "taking hold" and of ongoing transmission, even from bat to bat, decreased the more distantly related the bat species were. The rabies virus, the researchers said, needed a "closely related host" to be able to jump species.